After many Moons, we are proud to share with you the final, playable build of the "Legacy of the Yods" Tech Demo. This is dedicated to all of you who have been waiting for so long. 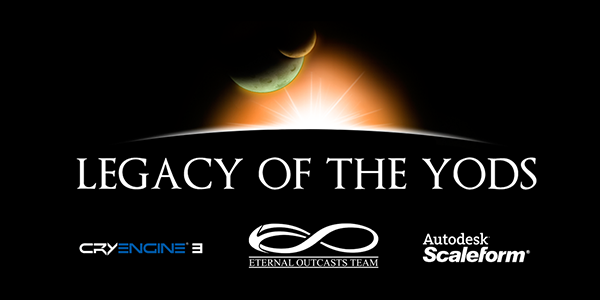 After many Moons, we are proud to share with you the final, playable build of the "Legacy of the Yods" Tech Demo. Built with the use of latest technologies (at the time!) we are proud of the road we've taken, the experiences we had and the possibility to bring you to this world we have all been working so hard on. We can say many things about the game... but we believe it's best you just dive in. "Normal" and "Classic" way of playing. Fully voiced cast of characters. Beautiful, cinematic and dynamically adjusted soundtrack. Two locations for you to sight-see. Combat.. and limited AI - that still needs some work. Environments which take full advantage of DirectX 11 features. Support for your Gamepad Controller (supports all Xbox 360-compatible controllers and DualShock 4 via Steam). If you liked our game, make sure to leave us a positive comment and give us your "thumbs up"!! With love, the Eternal Outcasts Team. Thank you for being with us for so many years. Thank you very much for your comments. We really appreciate your support! May the Yods be silent. Oh my God ,i was wondering what happened to this. I remember the demo being amazing at the time. Took me a ages to download at the time because of the cryengine thing. Great to see we can download a new version. Can it be played with M & KB? Of course, the game was designed for mouse and keyboard, but we added the optional gamepad support for those who like it.